It’s Masters week! The biggest golf tournament of the year takes place this Thursday to Sunday in Augusta, Georgia. All of the top players in the world are ready to compete for the Grand Slam, and with Tiger Woods playing some solid golf heading into the week, this years Masters is sure to garner a ton of attention. On this page I will outline our top rated sportsbook for betting on The Masters, look at the odds, my top winner pick, and finish with a 3 step guide you can follow to get your Masters bets placed online. BetOnline.ag is our top rated betting site for betting on this years Masters. BetOnline accepts players from everywhere in the world, including the United States (with no state restrictions). BetOnline is a great bookie for golf betting with their odds always being very competitive and often times they will offer the best return for a good number of the golfers outrights. Check out our full review here. These are the odds for all of the players with 40/1 or better odds. To see the full list head to BetOnline.ag, open the ‘Futures’ drop down menu in the sportsbook and select ‘Golf – Futures’. 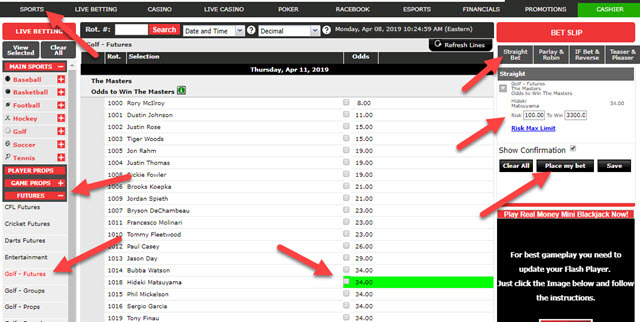 BetOnline also has a wide variety of other Masters bets you can place, including groups betting, round leader, top 10, top 5, and various other props. You can find all of these odds under the ‘Futures’ drop down menu. I like Hideki Matsuyama at 33/1. He’s had a quiet, but solid year and he seems to be rounding into form. He had a great weekend at The Players Championship a few weeks back, shooting 11 under on the weekend to finish T8 after a sub-par first two days. He’s also shown that his game can translate well to Augusta, with 4 straight top 20 finishes in The Masters over the past four years. The last four Masters winners have been first time Grand Slam winners, and I think Hideki is one of the golfers yet to win a major who are ready to make that jump. Follow these three steps to get your bets placed on the Masters. Whether you live in American or around the world, you can follow these steps and get your Masters bets placed within minutes. After logging into your new account click on the big green ‘Deposit’ button. Select your preferred deposit method (Visa, MasterCard, Bitcoin, Skrill, Neteller, etc) and complete the instructions to make the deposit. Use promo code BOL1000 when making the deposit to opt-in to the 50% up to $1000 first deposit bonus offered by BetOnline. It’s time to place your Masters wagers! Click ‘Sports’ from the top menu bar, open the ‘Futures’ drop down menu and select any of the ‘Golf’ betting links. Select the bet you want to make and click ‘Straight Bet’ under the Bet Slip in the right sidebar. Enter your wager amount and click ‘Place my bet’ to lock in your wager. Check out our golf betting section for more information about betting on golf tournaments. 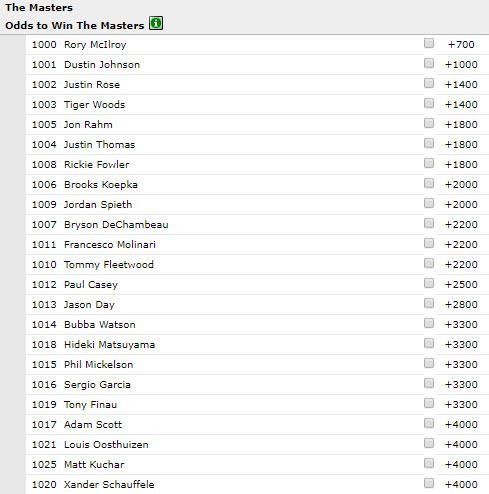 We also have a dedicated US Masters betting page.